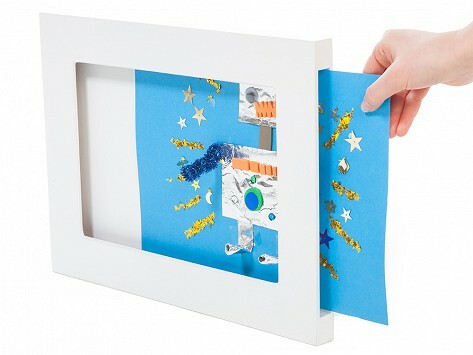 The Articulate Gallery is a range of slot-sided picture frames designed to showcase and celebrate children’s artwork. These frames are made without glass to accommodate flat or three dimensional work. Proudly display one of your child's timeless pieces of art. Dimensions: 11" x 15" x 1.6"
I love, love love this. It takes a messy fridge to an art gallery. A real-life mom and dad solved a problem for parents everywhere: how do you display your children’s artwork? 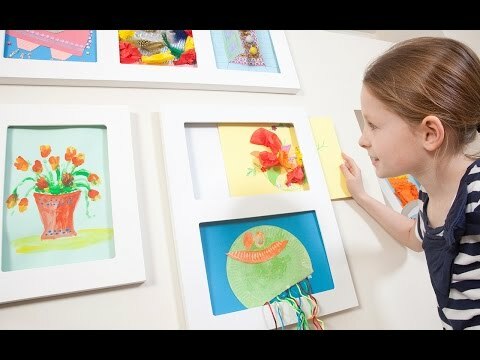 The answer is Articulate Gallery, with open faced frames that let you show off your child’s latest project in an instant. Simply slide any artwork into the slot on the side, and it’s on display for all to see. About ¾” deep, Articulate Gallery frames easily hold several pieces of paper (just slide the new ones on top). Their open, glass-free front means 3D artwork is no problem. So show off those macaroni, tissue paper, and pipe cleaner creations. A small family owned business near Glasgow, Scotland, Articulate Gallery began when mum Eona Craig was tired of showing her sons’ drawings on the refrigerator. She designed this clever kid’s art frame to keep their newest work on display and the refrigerator door free. Her husband, Colin, made the prototype and helped usher the frames into production. These frames are truly something the entire family can enjoy. Best of all, kids will get a kick out of having their very own revolving art gallery in the house.